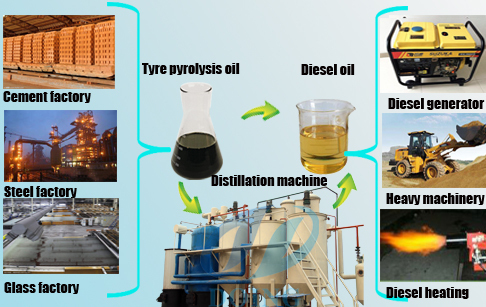 Tire pyrolysis oil is a new type of renewable energy source extracted from waste tires using waste tyre pyrolysis plant. Tire pyrolysis oil can be used for fuel oil in all aspects of our daily life. It can also be used to further refine and refine the tire pyrolysis oil to obtain clean and transparent non-standard diesel oil with tyre pyrolysis oil distillation plant. From this we can conclude that the tire pyrolysis oil has a broad market prospect, the market price of tire pyrolysis oil is rising.Different countries, the price will also be different. However, as a renewable energy source, tire pyrolysis oil is used in all aspacts of our daily life. It is undeniable that it can bring considerable profits to us. On the basis of the same market price, DoingGroup's waste tire cracking equipment has more advantages, these advantages are mainly reflected in the same tonnage of the equipment, a relatively high oil rate. This means that if you choose DoingGroup, is wise !!!1. Vacuum device to provide negative pressure to drain oil and gas. Not only does it improve the oil yield, it is also an important safety device. 2. The most commonly used and most effective condenser in the oil industry. 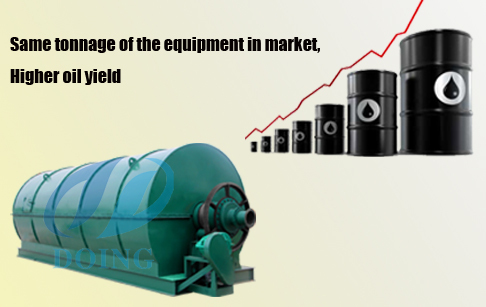 It can ensure that the cracked oil and gas is fully cooled and the oil yield is high. 3. Oil-water separators can purify oil and gas and prevent oil and gas from flowing back. Increase oil yield.DoingGroup provides you with technical guidance and solutions for refining tire oil. Please contact us for details. If you wanna to get more details about Tyre pyrolysis oil market price you can send E-mail to market@doinggroup.com. You can consult our professional engineer and specialized sales team with leave a message in below form.We will contact with you ASAP.You also can visit our factory in Henan,China.Get Detailed address.